A girl with a wine glass. Jan Vermeer (b. Delft 1632 - d. Delft, 1675), Dutch Baroque painter also known as Johannes van der Meer van Delft. 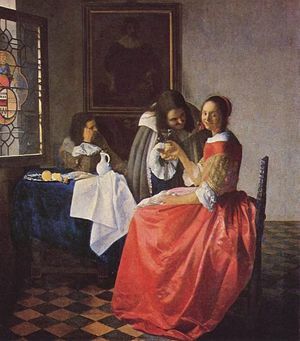 Only 35 of Vermeer's canvases have survived. In his works, he recorded the effects of light with a subtlety, delicacy, and purity of color that probably never have been surpassed. His most frequent subjects were genre, landscape and intimate interiors often with the solitary figure of a woman. A painter who excelled in portraying comfortable interior scenes that are composed with mathematical clarity and suffused with cool, silvery light. He is considered one of the greatest Dutch painters. Paintings Web Gallery of Art. This page was last modified on 18 January 2017, at 16:37. This page has been accessed 13,294 times.